Our life has been the same ole' stuff lately ... work, sleep, repeat till the weekend then rest for the injured (Ken) till another work week. Since there's nothing exciting going on, I won't bore you with the details. 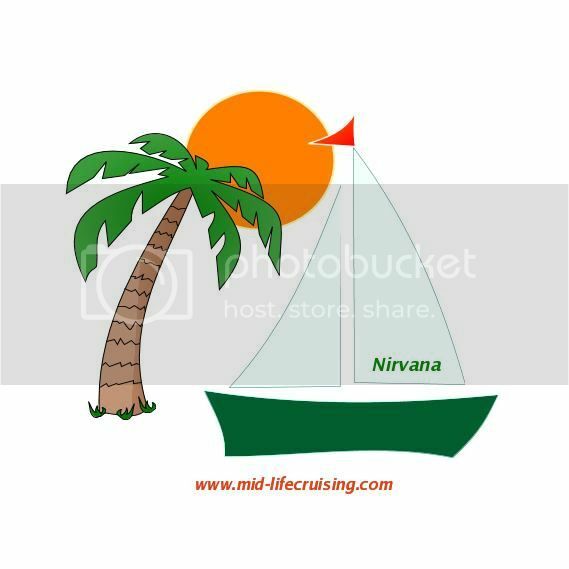 While Ken and I haven't moved on Nirvana yet, we're always focused on cruising. As a real estate agent in a slow market, I'm often sitting in my office reading cruising blogs and dreaming of the day we're doing the same. In a way it keeps me sane. It gives me something to look forward to and it.provides me with the knowledge that things will change. Our lives won't always be consumed by work ... and monotony. Cruising is our light at the end of a tunnel. Anyway, a while back I was dreaming and playing around on my computer. I was thinking of the Buddha decal that I'd like to create for Nirvana before we leave, and I somehow came across ImageBot. It's a tool for photo editing and creating drawings and logos. Now, I know nothing about graphic design but I easily learned the basics. While learning, I came up with the above picture. If only I could figure out how to draw a Buddha! You'll be cruising in due time. I remember the waiting to retire. It seemed to take forever to arrive and now it's been 10 years. It's wonderful too.